Chairville Elementary School’s principal John Karakashian and custodian Eric Spadea lay the ceremonial dirt for the Arbor Day tree-planting ceremony. Council members and local environmental associations joined with students at Chairville Elementary School to witness a ceremonial tree planting at the school. The occasion was the annual Arbor Day celebration, a holiday dedicated to planting trees. The ceremony marks the 40th consecutive year that Medford has been designated as a Tree City, USA by the Arbor Day Foundation. The town will be recognized by the state Department of Environmental Protection as one of the only two municipalities in the state to achieve this status. “A lot of towns in the United States are not a Tree City. 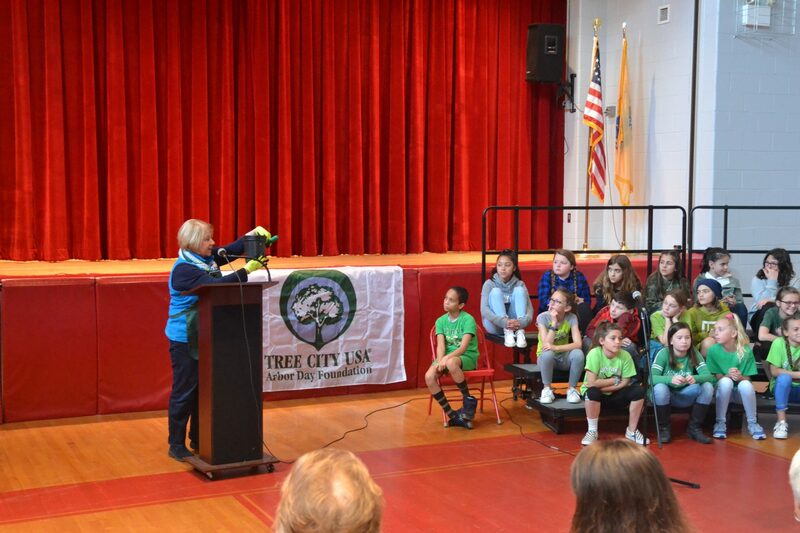 It’s very special that we are,” said Carol Milich, Pinelands Garden Club member and Arbor Day chairperson, during her speech. 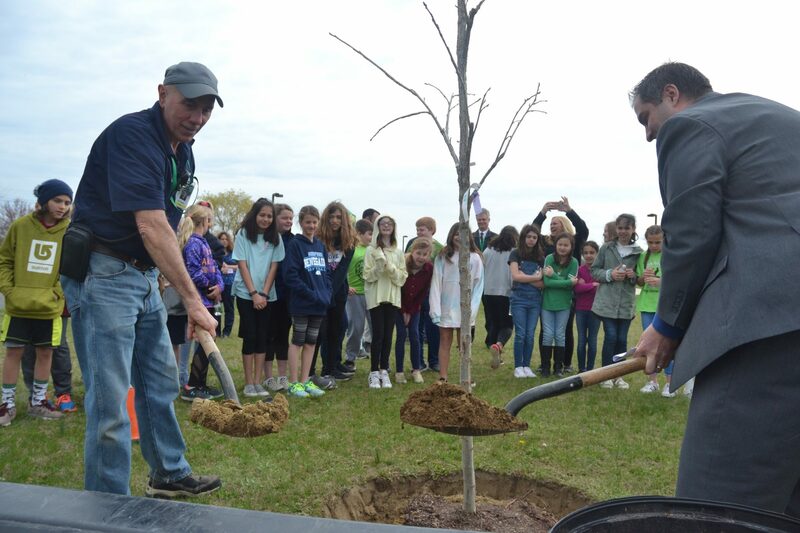 Attendees stood around the small Bur Oak Tree as Principal John Karakashian and custodian Eric Spadea took their shovels and ceremonially laid down the soil. “I want to thank you for helping us celebrate Arbor Day. Please remember to live in the present, always keeping an eye towards the future,” said Karakashian after he finished planting the tree. The tree has the potential to reach a height of 70 to 90 feet tall with a diameter of 10 feet. Students should be able to see acorns after a full year, according to the club. Before the tree was planted, members of the township’s Environmental Affairs Advisory Committee and the Pinelands Garden Club spoke to students, council members and student faculty in the school’s auditorium to share information on the importance of trees. Music from the school’s fifth-grade chorus and band accompanied the speakers. A club member read a poem. Another spoke from a passage of a book whose author visited Medford’s Pinelands. One talked about how trees provide people food and nuts, even almond milk. Master Gardener Diane Horner gives gardening advice to the students and crowd. She also gives advice to the Pinelands Garden Club members. Another member talked about objects made from wood that impact her and the students’ life, such as lumber for her house and paper in their classrooms. Master Gardener Diane Horner who sometimes gives gardening advice to the club, demonstrated to the crowd how to correctly plant a seedling. Councilwoman Lauren Kochan was there to read a proclamation that recognizes Arbor Day as a holiday in Medford. “Further, I urge all citizens to plant and care for trees to gladden the heart and promote the well-being of this and future generations,” Kochan said as she read the proclamation to the audience. On April 27, the EAAC will distribute 300 free trees to residents at the Town Wide Yard Sale in Freedom Park and will join with the Medford Vincentown Rotary to plant 40 trees in Cow Point in honor of the 40 years that Medford has been a Tree City.